How is the rise of mobile technology impacting our wellbeing and health? Published this week ‘Wellness in the Age of the Smartphone‘ attempts to begin to answer this question. 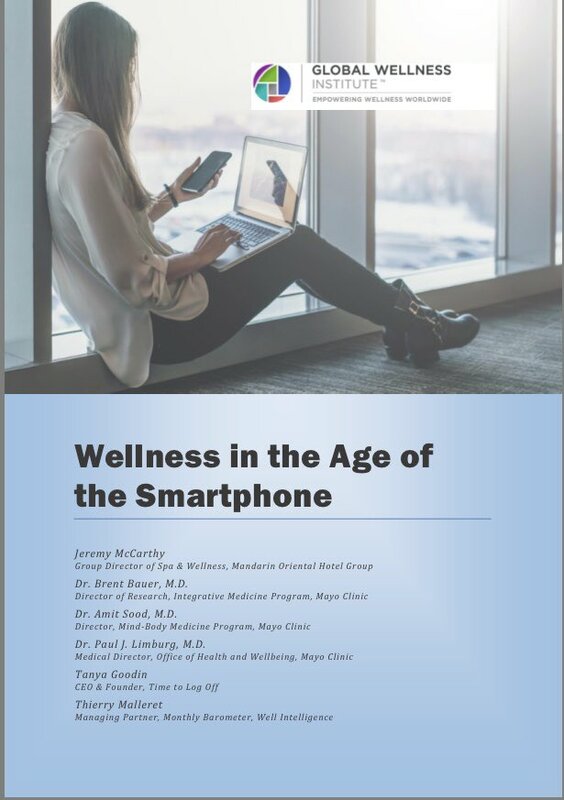 The white paper is the first paper produced by the Digital Wellness Initiative, of which I am a founder member, at the Global Wellness Institute. The goal of our initiative is to bring together thought leaders from across the globe in wellness, tech, healthcare, government, and education into this a non-profit think tank which will evaluate research and advocate for further policy and education on technology use and digital health. Digital health is a new concept and one that encompasses many fields and approaches. The members of the Initiative have very diverse backgrounds; from medicine to hospitality and economics and technology. In this paper, which took nearly twelve months to produce, we aimed to bring together in one place as much international research as possible that exists on the impact of technology on sleep, mental health, relationships, obesity, safety, and productivity. As a result of our investigations into what research is currently available we are calling now for much greater research and policy focus on understanding this crucial intersection between technology and wellbeing, and for a definition of what makes for good digital health. In the work I do as a public speaker on internet safety and health in schools and workplaces I am frequently asked what ‘healthy’ looks like for screen use. It’s still a question that unfortunately we don’t have many solid answers for. Much of the current research establishes a correlation between diminishing physical and mental health and using screens to excess, but there exists a real gap in research that proves a definitive causation. This is undoubtedly because our screen use is intertwined with so many areas of our lives now that untangling screen use from all other factors that influence our health is going to be tricky. As my work as a public speaker on internet safety has evolved into looking at screen health and what makes for a good tech: life balance, I am increasingly also moving into the field of tech ethics in ensuring we live with screens in a way that is healthy. In a previous blogs I have looked at the area of social media addiction and how much addictive features are deliberately built-in to social media software by the companies which design them. Any examination of what makes for a healthy digital diet will inevitably involve ‘Big Tech’ and their attitudes towards their consumers and how much of their revenue strategy is focused on maximising time spent on screens. It’s a hot topic at the moment and one that is bound to get us all talking much further in the future about our lives onscreen and off.